A highly practical, insightful, and motivational book that will help you to honor God with the money you have - whether you have a little or a lot. Some of us want to escape money. Some of us want to embrace money. We fear money, and we desire it. We think about it every day, and yet often we try not to think about it. 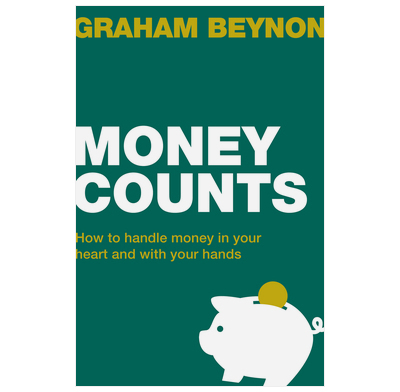 Graham Beynon shows us how to control our money rather than our money controlling us. In this readable, realistic book, he takes us to the gospel to show how we can handle money well in our hearts, so we can handle it confidently and wisely with our hands. Excellently practical, insightful and motivational. I enjoyed this book, found it challenging, and will be recommending it to others too. The way we view money and wealth reveals who we really are and what we really believe. This book will not only make you rethink how you view money, but will challenge you to rearrange the affections of your heart. This is my new go-to resource to help myself and others become better steward of God's blessings. Money Counts is gospel-rooted, sin-exposing and God-glorifying. There can be no doubt that we live in a society driven by money. many have fallen into the debt trap and are struggling to cope. dangers. Many will be surprised at how much the Bible has to say on the subject. to grips with money’, ‘How money became God’ and ‘Giving’ are particularly helpful. Bible studies on the subject will find it a resource filled with useful information. There are three brief and useful appendices, on the topics of debt, loans, mortgages and insurance. There is also a list of other resources. money. I hope that this title will be widely read and will help many to invest their time and money wisely for our gracious God. This book really helped me to see how God is most interested in our hearts, and how our use of money is to be defined by our life priorities as his children. What a challenging, heart-warming and liberating read! To be honest, I wouldn’t leap at the thought of reading a book about money. And yet, after finishing this one, I felt encouraged and helped. I guess the reason is that money is a problem for lots of us - whether we spend too much too fast, or hold on to what we have too tightly. We know it’s an issue, and we feel uneasy about it. So actually, reading this book is like a breath of fresh air. It reminds us of how to think about money in a good way. And then shows us how to use our money in a good way. In fact, it is advocating a way of life that less burdened by the problems of money. And who wouldn’t want that?! This is a very accessible, Bible based, practical book which every Christian should read. It won't take you long, but the message is powerful. We need to simplify our modern lifestyle! I've read a number of books on the subject of the Christian & Money, this is the best I've read. It is bible based and deals practically, spiritually and honestly about something that we often feel we don't get right. I highly recommend it, should be a standard read for every believer.